In the “Report” module one could create a report for any of the predictions performed with the Toolbox or a report related to the consistency of the current category. 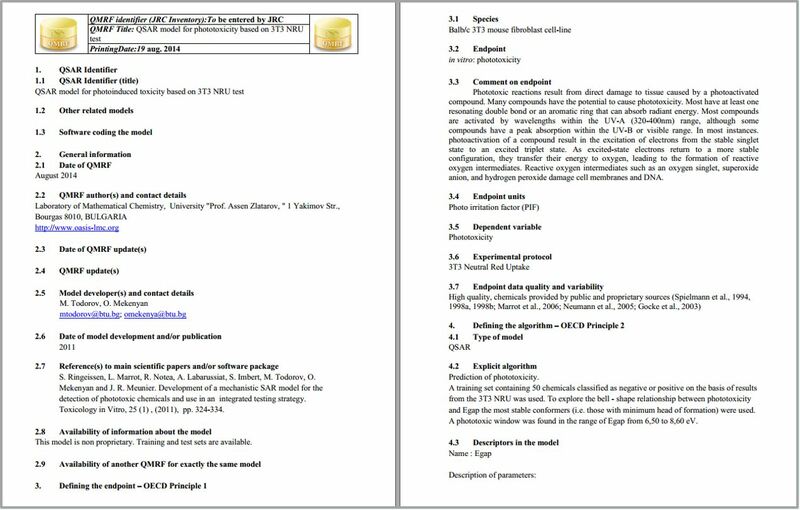 Additionally report files for the chemicals in the data matrix (Data matrix report) and for the available (Q)SAR models (QMRF reports) could be generated. 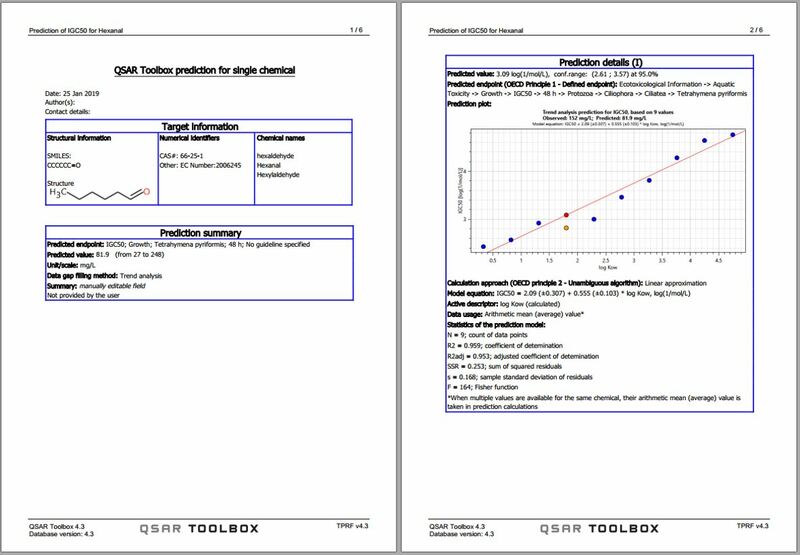 Report a prediction – once the data gap of the target chemical is filled, a prediction report could be generated. In the Report Wizard pages one could customize the report by adding personal information, additional pictures/ texts/ data, to move up/down the sections, etc. Some of the Report Wizard pages related to how the prediction is obtained will be automatically populated by the system. Additionally, Data matrix report and a report for the consistency of the final category (the target and used analogues) are generated as supporting files to the prediction report. Report the consistency of a category – a special developed and organized report related to the consistency of a category with respect to a given property could be generated. In case the category elements are applied, most of the information in the category report will be automatically populated. The Category report consists of two parts: 1) Category definition and members – providing more general information for the category; 2) Consistency check – providing information for the physico-chemical, structural and mechanistic consistency between the category members. The Category report allows user to personalize and customize its contents. Export the chemicals on the data matrix and related information – The Data matrix report generate an excel file report for what you see in the data matrix. Additional information (profiling results, parameters, data) could be also added. 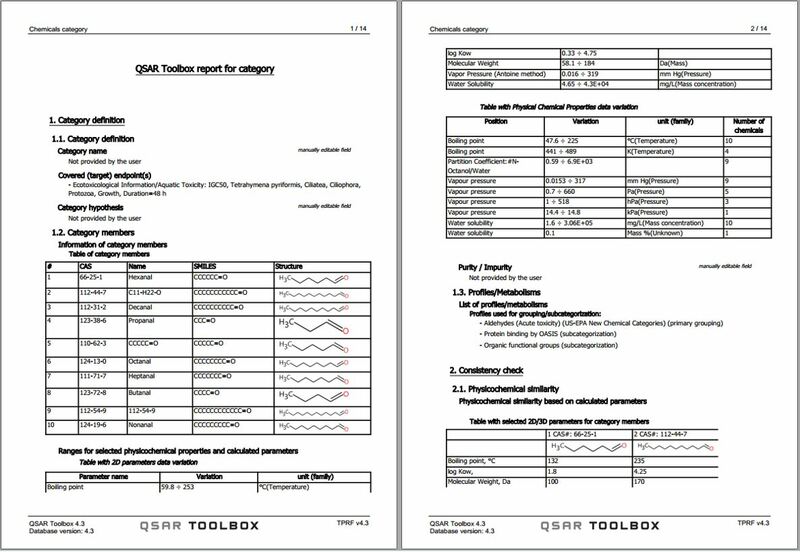 Generate QMRF – QMRF (QSAR model report format) could be generated for any of the available QSAR models in Toolbox (external (e.g. ECOSAR) or custom (Q)SAR models). Include RAAF AE in the report – Read-Across Assessment Framework (RAAF) has been developed by ECHA as internal tool providing a framework for a consistent and structured assessment of grouping and read across approaches under REACH. After selection of the appropriate RAAF scenario all corresponding assessment elements (AE) will be automatically appended to the Report Wizard pages. Find out more information about RAAF here.